b.j. spoke gallery announces a call for artists for Expo 38, a competition judged by Erica Cooke, Research Fellow at the Museum of Modern Art, NY. Artists may submit up to six images and/or two videos. All visual fine arts media are acceptable. No crafts. Chosen artists will participate in a one month exhibition at the b.j. spoke gallery in Huntington, NY in March of 2019. There will be a reception for artists and the public in March. The gallery attempts to include several images by the chosen artist, where possible. They have an online presence on Facebook, Twitter, and Instagram and publicize the show to local news media. In addition, a blog post with the artist’s statement and an image appears on their website. They publicize the show with a monthly newsletter and ezine which is sent to their mailing list. b.j. spoke gallery is an artist cooperative and not-for profit 501(c)3 with an enduring community outreach. It has been a presence on Main Street in the heart of Huntington since 1990. b.j. spoke gallery was founded with the belief that a partnership between artist and public is an essential relationship. The gallery provides the opportunity for artists to experience responses to their work and for the public to increase its aesthetic awareness in deciphering of the artist’s intent through contemplation and dialogue. For more information, contact liz.ehrlichman@bjspokegallery.com. b.j. 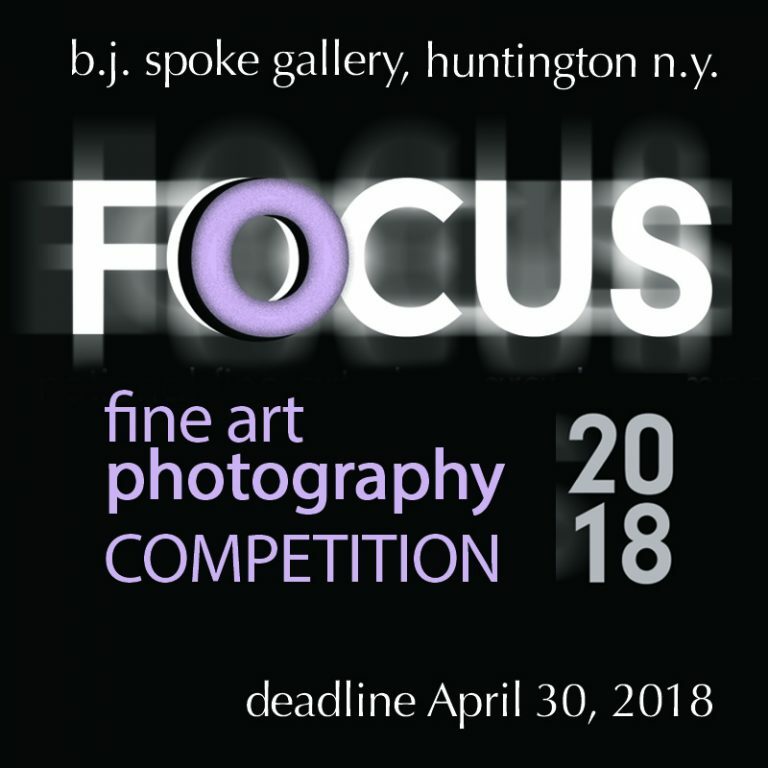 spoke gallery announces a call for artists for Focus 2018, a national, fine art photography competition juried by Kelly Sidley, Curatorial Assistant, Department of Photography at the Museum of Modern Art, NY. Entry Fee: $35 for up to 6 images/works, all of which could be selected for exhibition. Artists will be judged on their body of work. Open to U.S. residents 18 years of age or older. Focus 2018 Juror: Kelly Sidley, Curatorial Assistant, Museum of Modern Art, NY. Ms. Sidley was a Lecturer (2007-2015) in MoMA’s Education Department and contributed to many exhibitions including Out of Time: Contemporary Art from the Collection (2006-2007); Comic Abstraction: Image-Breaking, Image-Making (2007); Aernout Mik (2009); Inbox: Hans-Peter Feldmann (2017); and Louise Lawler: Why Pictures Now (2017). Selected artists will have up to six pieces included in a one month exhibition at the b.j. spoke gallery in Huntington, NY from August 1-26, 2018. b.j. spoke gallery will host and promote an opening reception on August 4th 6-9pm for exhibiting artists and guests. Winners posted on b.j. spoke website with featured works and artists statement, in social media, and local press. b.j. spoke gallery is an artist owned and run cooperative art gallery and non profit 501(c)(3) organization, in Huntington, NY. They exhibit the work of members 10 to 12 months yearly. Members embrace many media, styles, and expression. They not only bring art to b.j. spoke gallery, but also share their expertise and talents in successfully managing the gallery. Members’ dedication to the arts and b.j. spoke gallery has enabled the gallery to hang one show per month, run two juried competitions per year, and have an open submissions event for our community, as well as host poetry nights, charity events, artist talks, and a bi-monthly artist circle discussion group. Perhaps most important, the gallery provides a space for the community. Members talk about art and the ideas that keep them painting, sculpting, moving, and changing. b.j. spoke gallery announces a call for artists for Expo 37, a fine arts competition and exhibit in Huntington, NY. This is the 37th in a long tradition of Expo shows. Expo 37 will be judged by Cara Manas, Assistant Curator, Department of Painting and Sculpture at the Museum of Modern Art, New York. Artists from anywhere in the United States may submit up to six images and/or two videos to apply. All fine arts media acceptable, no craft. Several works by each of the winning artists will be shown. Selected artists will be included in a one month show at b.j. spoke gallery in March 2018. Expo 37 is different from other competitions. Artists have a showing of multiple works, depending on size and the juror’s selections. Showing several works enables gallery visitors to better appreciate what the artist is about. Submitting a small body of work has greater impact and meaning for the juror as well. The show will be publicized in local and social media. The gallery is open to visitors six days per week. b.j. spoke gallery is a small cooperative in Huntington, NY. It has been in existence since 1975. The gallery is a not for profit organization. The mission is focused on the artistic community and outreach. The gallery offers a monthly poetry group, bimonthly artist circle, an opportunity for local artists to hang work side by side with members in our annual “Harvest of Artist” shows, and fundraisers for worthy causes. In addition, community outreach includes shows in which contemporary artists from across the country are brought to our neighborhood’s doorstep. For more information, contact liz.ehrlichman@bjspokegallrey.com. b.j. spoke gallery announces a call for artists for the Paperworks 2017 Juried Competition. Artists in the United States who use paper as their primary medium, substrate, or subject of a video may apply. Accepted media: Works made of, on, or about paper including cut paper, folded paper, woven paper, glued paper, drawings, paintings, pastels, prints, photography, paper sculpture, 3D, bound books, collage, mixed media, video, and installation. Juror: Akili Tommasino, Curatorial Assistant, Museum of Modern Art, NY. An advocate of emerging artists and scholar of the twentieth-century avant-garde, Tommasino has organized and collaborated on numerous exhibition projects at institutions including the Centre Pompidou – Musée national d’art moderne, Paris and National Gallery of Art, Washington, DC. He is the curator of 2017 MoMA exhibition Projects 107: Lone Wolf Recital Corps. Paperworks 2017 Juried Competition artists will receive a one-month exhibition of selected works in August 2017 at b.j. spoke gallery, Huntington, NY. Artists can enter up to six works. All of which could be selected for exhibit by the juror. The gallery provides an opening reception and publicity for the show. b.j. spoke gallery is a member-owned and run cooperative art gallery and 501(c)(3). They exhibit many of the finest artists on Long Island and provide art and opportunity to the community at large. Artists showing at the gallery are well-represented in numerous public and private collections. b.j. spoke gallery was founded over 40 years ago with the belief that a partnership between artists and the public is an essential relationship. The gallery provides opportunities for artists to experience responses to their work and for the public to increase its aesthetic awareness in deciphering of the artist’s intent through contemplation and dialogue. Fotofoto Gallery announces a call for artists for their 12th National Photography Competition. Only photographic mediums will be accepted and approximately 30 images will be chosen. Maximum height or width of artwork is 24″. The competition will be juried by Stephen Mayes, editor, curator, and critic. Fotofoto Gallery was formed in 2003 by a group of fine art photographers whom desired to create a center where photographic visions could be exchanged. We continue to be the place for the photographic community to view a wide range of photographic processes. For more information, contact brucecohenphotography@gmail.com. b.j.spoke gallery announces a call for artists for the Expo 36 competition, judged by Jennifer Harris, Curatorial Assistant, Museum of Modern Art. Up to six works and/or two videos may be entered. The chosen artists will participate in a month-long show at the gallery in March 2017. We attempt to include several works from each accepted artist, where size permits. b.j.spoke gallery is an artists cooperative. b.j. spoke gallery announces a call for artists for Paperworks 2016, a national fine arts competition. Juror: Heidi Hirschl, Museum of Modern Art, N.Y.
Open to all artists living in the United States who use paper as their primary medium, as a substrate, or subject of a video. Works made of, on or about paper are eligible. Entry fee is $35 for up to six works. Award: A one month exhibition of selected works, August 2016 at b.j. spoke gallery, in Huntington, New York. b.j. spoke gallery was founded with the belief that a partnership between artists and public is an essential relationship. b.j. spoke has been enriching the community with art and empowering artists with community for over 40 years. b.j. spoke gallery will host EXPO 35, its 35th annual competition in the fine arts. All artists living in the United States are eligible; all fine arts media are acceptable. We attempt to include several pieces from each winning artist, where size permits. There is a $35 fee. Our juror is Mary Potter, Curatorial Assistant at the Whitney Museum of American Art. The award for winning is participation in a gallery show in March of 2016.
b.j. spoke gallery is an artists cooperative and not for profit 501(c)3 organization. We have been in existence for 40 years and holding the EXPO competition for 35 of them.